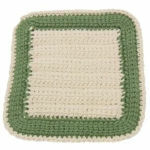 Summer Wreath Napkin Ring -- $1.99 A Crochet pattern from Julie A Bolduc. This napkin ring is a result of a crochet challenge. A member of the JPF Crochet Club wrote to me about a challenge she had for me. She said she just emptied a transparent tape roll and thought that Julie could design something with it. Since I had already designed a Christmas Wreath using the tape core, I thought why not go ahead and try to design something else with it. She had a napkin ring in mind and this is what I came up with.